We've eaten our fill of raspberries, gorged ourselves on strawbs, popped all the buttons off our clothes with cherries, eaten punnet after punnet of peaches... but wait! What is this, all beautiful and red and jewel-like? It's redcurrants! Redcurrants, join the party! We didn't mean to leave you out, in fact, now that you're here, we've suddenly remembered that you're our favourite, most underrated summer berry. Pull up a chair. Have a drink. These light, summery cupcakes are positively redolent with redcurrants (sorry I'll stop) with a hint of rose jam providing a fragrant note that's as nostalgic as a summer spent eating cucumber sandwiches in the Cotswolds with your Aunt Hyacinth. Preheat the oven to 180C/350F/Gas mark 4. Lightly grease and line a 12 hole cupcake tin with cases. Combine the flour, sugar and baking powder in a bowl. Beat the egg in a separate bowl or jug, along with the milk, yoghurt and vanilla. Soften the butter until almost melted, then stir into the egg mixture. Pour into the flour mixture, stirring until just combined and there are no streaks of flour showing. Pull the redcurrants off the stalks, and place in a bowl with the extra 1 tbsp of flour. Lightly stir around until the berries are covered with a layer of flour. (This will ensure they don't all sink to the bottom). Gently fold into the cake batter. Spoon into the cupcakes cases, filling them 2/3 full. Leave to cool in the tin for a minute or two, before transferring to a wire rack to cool completely. Remove the redcurrants from their stalks and place them in a small saucepan, along with the sugar and rose essence. Cook gently over a low heat for 5-10 minutes, or until the juice from the berries has reduced and only a few of the fruits retain their shape. When the cakes are cool, cut a small inverted cone shape in the top of each cake. (Sacrifice the remaining pieces to the cake god, also known as secretly eating them). Splodge a teaspoonful of jam into the hole, spreading out a little. If using the cream (why wouldn't you?) whip in a separate bowl until stiff, then pipe or spread on top of the cakes. 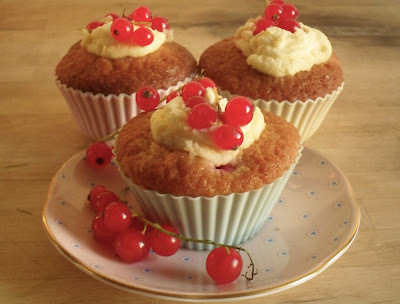 Decorate with the remaining redcurrants and try to stop dribbling. I have loads of homegrown blackcurrants. I'm going to go off piste and try this recipe with those.